Carr Pond Vacation Rental #6662 LakeHouseVacations.com Rent Me! Situated in Western Coventry, RI this secluded Cottage is situated in the midst of a 300 acre preserve, part of the “Maxwell Mays Wildlife Refuge, AUDUBON’s newest acquisition. Located 1 mile into the preserve, the cottage sits in the middle of the woods overlooking the lake. The property's private lake and cabin are secluded, a real retreat. Great place for canoeing, bird watching, nature walks, great trails and bike path close to the property. Spectacular sunsets. Perfect for a romantic week or week-end get-a-way or a family vacation. Kids love it here! Property comes equipped with two canoes. Available from May 1 until October 31. We prefer to RENT BY THE WEEK IN JULY AND AUGUST, the prime season for rentals,as we are trying to raise funds to run programs at the Maxwell Mays Preserve. WE DO OFFER THE PROPERTY FOR LAST MINUTE RENTALS if the Cottage is not occupied. We will be happy to place your name on a list for "LAST MINUTE RENTALS" and will notify you if dates are available. THIS PROPERTY IS NOT HANDICAP ACCESSIBLE. Enjoy 300 private scenic acres, pastures, woods, trails. for hiking, bird watching. 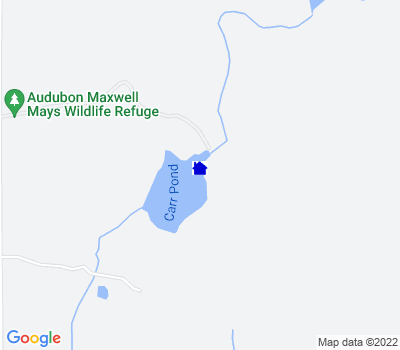 Renters have "exclusive use" of Maxwell Mays Pond and its surroundings. Catch and release fishing, canoeing, swimming. The property has 2 canoes for your use. We ask that you do not bring any equipment, canoes, etc. to the lake unless it has been carefully inspected and washed clean. Be on the look-out for aggressive weeds like “milfoil” as they will contaminate and choke the lake. Situated in the western part of RI, the area includes many quaint villages, a genuine 'general store' and two great golf courses nearby. Close to, bike paths, trails, antiques, shopping, theaters, RI beaches, restaurants. Located 20 minutes from Wickford, Narragansett, South Shore, Putnam CT Also nearby Newport & Providence, Boston. DEPOSIT OF 50% REQUIRED TO HOLD ALL RESERVATIONS! Balance due two weeks prior to arrival. THERE ARE NO LINENS OR TOWELS provided for rentals of less than one week. Please feel free to bring your own linens and towels. Please bring bottled water for drinking. ALL TENANTS ARE EXPECTED TO CLEAN THE COTTAGE PRIOR TO DEPARTURE. TAKE TRASH BEFORE LEAVING. OR BRING TO THE BARN . Trash pick up day is Monday! PLEASE BRING YOUR OWN BEACH TOWELS FOR THE LAKE. This ad has been viewed 47793 times. "My family and I enjoyed splendid time at Maxwell Mays for the second year in a row. The peace and serenity offered here is a treasure. We fished, hiked, swam, canoed, birded, explored, discovered, laughed and laughed! And of course we really did not want to leave. Dreaming of visiting again next season..."
"We've stayed in this cabin twice - once Sept 2016 and then again the last week of Oct 2016. What a special treat to escape to a quiet, tranquil, cabin in the woods. Canoeing on the pond was a particular high point; checking out what was in the water below is always fun. The first visit we went with friends and then the second visit was just my husband and I, closing out the season. Both visits were equally enjoyable so we'll be sure to return. Thank you for sharing your property, Audubon! " "Quiet, Quaint, Peaceful! What a wonderful little hideaway! We so enjoyed ourselves...walking, fishing, talking and being quiet. What a change from our busy Southern California lifestyle. Renewed, refreshed, we carried on with our travels. Thanks for sharing this little peace of heaven. Bill and Bonnie, from So Ca Guestbook 10-16-16"
"What a great retreat. Absolutely amazing hidden spot. A great break from the hustle and bustle of everyday life. our family of 5 had so much fun here. We did many canoe trips around the pond and saw tons of dragonflies, turtles, fish and osprey! Went fishing everyday and caught tons of fish from a pumpkin seed, pickerel, pike, bass and even a 3ft. eel!! We were pleasantly surprised how well maintained the house was with everything you need to cook and clean and stay. the best part ab out staying in the woods was no mosquitos! We believe that the dragonflies out here are doing their part to eat them all up. We are so happy with our stay and look forward to coming back soon! The Powers Family ...From Guestbook Labor Day Weekend 2016"
"This property is incredible. We had private access to a pond which offered outstanding catch and release fishing. Wildlife is in abundance. We saw northern water snakes, ring-necked snakes,wood ducks, herons and a variety of song birds. At night we could hear the calls of screech and barred owls. The house is very cozy with a working fireplace. Our travel time to the property was 45 minutes but felt like we were in the Maine woods with complete privacy. It sure was nice not spending hours traveling up north to get away for a weekend. We are already making plans to return to this wonderful place. " "My wife, and 6 month old son stayed at the Maxwell Mays cabin for a weekend last October and couldn't have had a better experience. The cabin is rustic, quaint, and quiet - just what we were looking for. It has what you need, and is clean as can be, but don't expect a fancy night at the Ritz. Bring plenty of food and drinking water and plan on staying put. At night we sat by the fire. In the morning we went on a long hike and didn't hear or see anyone or any signs of modern civilization. We had the trails to ourselves! Fishing during the day was fun, but due to the windy conditions the canoe didn't prove too effective. Fishing from the dock at dusk was THE BEST FRESH WATER ACTION I'VE EVER HAD! Every cast we caught a bass. It was super fun, especially for my baby son, who had never seen a fish before. This is a truly special place that is perfect to "check out" and recharge. I highly recommend it! " "We have been to the cabin 4 years in a row. It's a wonderful place! Peaceful and private beyond your wildness dreams. The price is getting high! The canoes both needed small patches to be water tight. I was able to fix them both with a fiberglass repair kit. We will be back but trying another one this year"
" Mary and I spent a long, incredibly relaxing weekend at Maxwell Mays Audubon and saw many "firsts" for us new birders. Scarlet Tanager couples, Ovenbirds, Veerys, Canada Warbler, Blackbilled Cuckoo: also seen were Black and White Warbler, Prairie W., Red Eyed Vireo, Phoebes, B. Orioles, Wood Thrushes, and heard not seen, Barred Owls. Mike K. "
An early Spring weekend and a step into a past time. Morning chill mixed with a symphony of bird calls...some known, some mysterious to our nascent ears. Such a wonderful wilderness experience only 40 minutes away in Coventry! thank you Mr. Mays!" We had some first experiences here, like yoga on paddleboards (lots of splashes, laughs and climbing back on) and played more games than we'd played together in a weekend. Heard a Barred owl our second night. LOVE THAT! Grilled pizza was amazing too. So peaceful for all of us. Thank you Maxwell Mays, Audubon (and others) for this amazing retreat!" Great stay. Great weather. Beautiful views and canoe excursions. Heard the owl last night and saw over the porch a Broad-winged Hawk, (possibly) several harriers and a Turkey Vulture. We hope to return! Thanks Audubon, & Mr. Mays!" My husband and I spent three days and two nights in the wonderful home, celebrating our 25th wedding anniversary! It is so beautiful and peaceful! We walked around the pond, M ark did some fishing and caught a fish (bass). Mostly we set on the screened porch ant talked... A romantic night was also spent in front of the fireplace (a little warm) but very romantic. I am looking forward to returning!" Peaceful and a true wind-down from our busy life! Saw an hours-old (or day old) fawn, hiked the farthest loop, spotted the wild irises by the shore, fished and enjoyed the larch by the kitchen sink. the first retreat of many"
"Please know that we had the most wonderful time while staying there. It was truly magical and hope it will be the first of many stays. The weather was perfect, the cabin charming and so very peaceful. It was a perfect way to end the summer for my husband and myself. "Stayed in the third week in june and it was perfect, cool nites with pleasant breezes off the lake.Warm sunny days water was perfect. Loved it too much coming back again next year!" "We treated ourselves to three days and nights here at the end of June 2013 and it was perfect! Despite the weather being a bit rainy for a couple of those days, it was still wonderful...walking the trails, sitting on the dock, enjoying the screened in porch at all hours, accompanied by the incredible music of birds everywhere. When we saw our first fireflies of summer the magic was undeniable. For peace and quiet (but for the birds) you can't get any better than this. Many thanks!" "A wonderful place. Thank you." "Brothers fishing weekend, June 8-9 2012. The cottage is comfortable, well kept and includes the necessary "stuff". The fishing is spectacular and the quiet is overwhelming in the best way. Raquel is great to work with and we plan on a return visit. Tim Henry"
Did not matter that it rained almost the whole weekend - Perfect spot. My book took a massive leap forward! Will be back!" Just what we needed and were looking for! Quiet weekend away surrounded by nature! Perfect place for relaxing and getting away from the usual day-in, day-out crazies! Hiking, playing cribbage and doing crosswords in front of the fire; canoeing the pond...lots of fishing and lots of fish (the two don't always happen together!) All and all, a very pleasant weekend!...Oh well, back to the real world today!" We enjoyed our stay here. Last night we heard an owl call directly behind the house and this morning, a blue heron flew across the pond." This has been a lovely 5 days on Carr Pond. We've enjoyed the lake and hiking the trails. On our last day we were rewarded by seeing a blue heron perched on a rock in the pond! This was a wonderful respite for our family." Wonderful few days at the Carr Pond cottage - complete with grilled clams and corn on the cob. Kayaking on the pond, reading on the deck, glass of wine at sunset...the most relaxing few days I can remember in a long time. Thanks for renting a natural retreat in the woods to people who need time away from television and internet!" "Beautiful retreat. The sunsets on the lake were exquisite! "Beautiful seclusion. Tranquil, renewing and inspirational for anyone with a penchant for painting or writing. I actually wrote 8 poems while there and my husband made several sketches for his metal sculptures. We loved every minute of our week there. Thank you Max for "trusting" Audobon, and thank you Audobon for making it available to us. Thanks also to Agent Raquel who was warm, welcoming and accommodating. Roberta MacDonald"
"If you like privacy this is the place to stay. It is a vacation away from technology and a time to reconnect to your family. It is clean and well kept. The fire place is wonderful at night. We stayed there last year and just went again this year for a weekend away. Love it!" "Last September we spent 3 wonderful, relaxing days on this property. It was a surprise getaway my husband had planned for us. I couldn't believe the beauty of the place. We loved the quiet and tranquility.. It was a very memorable time. We hope to go again this year."